We all get stuck in a rut when it comes to therapy planning — and especially when it comes to materials! I don’t know about you, but I have certain games I just always use. I’m sure you feel the same way: there are games and materials you chose the same old thing because you can rely on it. But it’s time to try something new! 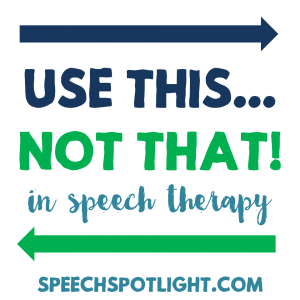 The speech paths here at Speech Spotlight have some easy suggestions to update your materials stash that will push you out of your comfort zone while still meeting your students’ goals. Speech Sprouts: Do you have those plain old vocabulary bingo games on your shelf? Put ’em away and try Speech Sprouts Bingo Riddles. The fun twist is that students need to guess the rhyming riddles to play. They love trying to be the first to guess the answer and find it on their board. You get to target multiple goals with one fun activity: Name to a description, listening, seasonal vocabulary and rhyme. Easy to modify for a wide range of ages- you will use it across your caseload and it’s terrific for in-class therapy too. 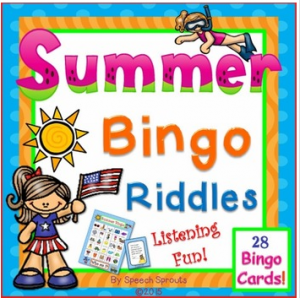 Here’s Summer Bingo Riddles. Packs are available for holidays and back to school too. AGB Speech Therapy: Tired of Old Maid and Crazy 8’s? 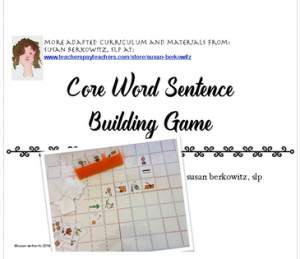 Try a reinforcement game from AGB Speech Therapy. 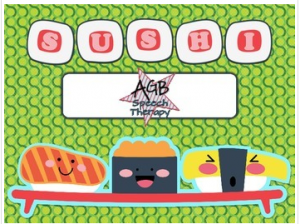 This SUSHI game is adorable and fun for Pre-school through 6th grade! Target matching with little ones or following directions and turn taking skills with all ages. This game has enough cards for 8 students to play at once. Best of all, it can be used with mixed groups because each student draws cards following a talking turn. Put a little fun back into the session with reinforcement games! 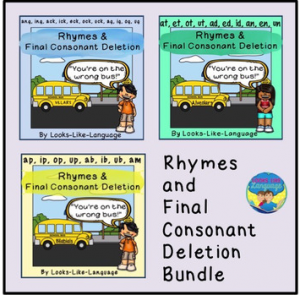 Looks Like Language: Had enough of singing “Wheels on the Bus?” How about yelling, “Get off the bus!” Your Pre-k to early elementary kids will have a blast working on the process of final consonant deletion while improving rhyming skills for literacy in this fun game from Looks Like Language: Phonology: Final Consonant Deletion & Rhymes Activity Bundle. 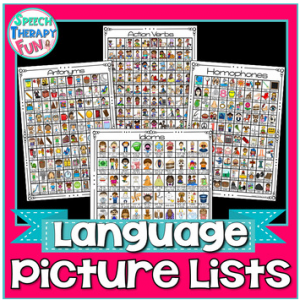 There are 186 picture cards in the bundle, worksheets and sorting activities, too! TLC Talk Shop: Tired of playing “Go Fish” with your phonology cards? 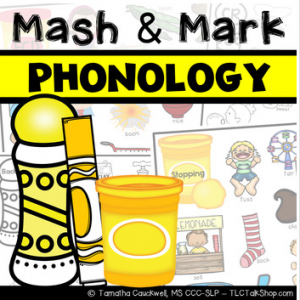 Try this Phonology Mash & Mark set. Flip a card containing the common minimal pair error while your students scramble to find the correct production on their mat or dauber page. Once they find the correct picture they practice the word at their level. First to find all the correct productions on their page, wins! Each dough mat and dauber page contains 15 words. Speech Therapy Fun: Tired of hauling around flash cards or trying to think of new targets? Use this No Prep Language Picture List set! Use them for games, progress monitoring, homework or functional decor! Each page contains 50-100 pictures. Alberta Speechie: Bored with playing card games for artic work? Try playing artic dominoes instead. 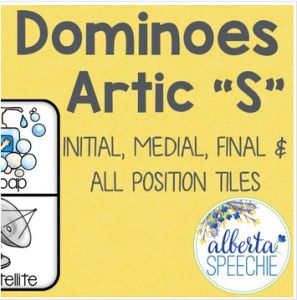 Set includes dominoes with pictures for younger students and dominoes with just the word written for your older students. Anne Page from Beautiful Speech Life: Frustrated with teaching prepositions and not getting results? 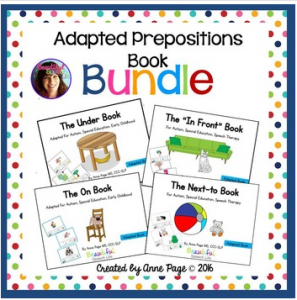 Try these interactive adapted prepositions books. Teach one concept at a time using multiple repetitions. Each book book contains pictures of everyday objects (and some silly objects to keep it fun) to teach the concepts. Pictures are age appropriate for older students as well. Presented on a white background to avoid confusion and distraction, these simple pictures encourage vocabulary development. The book provides opportunities for multiple repetitions. A visual sentence strip at the bottom of each page allows students to follow along during group work. Sarah Wu – Speech is Beautiful: Do you have no idea what to do with Spanish speaking students with Apraxia? Me too! 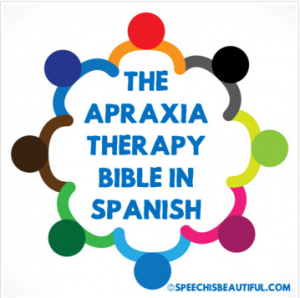 I had nothing, nada, zilch to use in therapy with them so I created The Apraxia Bible in Spanish: Intensive Intervention for Early Readers. After spending many years observing how bilingual kindergartens teach kids how to read, I modeled my apraxia intervention in the same style so that students with apraxia learn motor movements in the same pattern of letter sound acquisition and syllable blending I’ve seen used in teaching students how to read in the classroom. Grab it to finally have spanish apraxia materials! Lots of great new activities to try! Thanks for a terrific round-up.